In “LOVE BOAT”, a witty wind will take you to the heart of the dreadful crossings of the Mediterranean, the last hope of freedom for tens of thousands of Syrians. 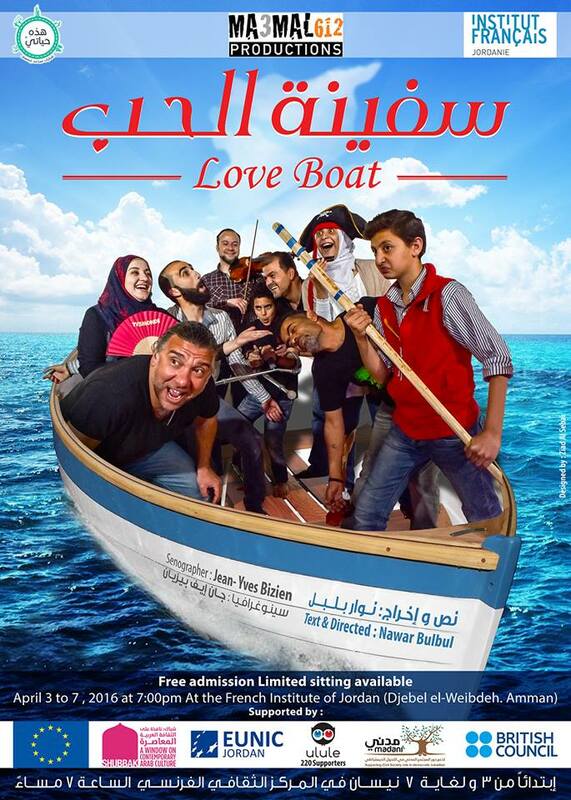 This tragic comedy draws the life course of a Syrian theatre troupe aboard on a modular “boat-scene” adaptable to its different destinations. In 2015, the members of the Syrian theatre company, that has been disjointed/dismembered just as Syrian society for the past five years, has decided to reunite somewhere along the Mediterranean coast. An actress, 4 actors and 1 children gather around a boat that will take them to the gates of Europe, where they imagine themselves being able to resume their theatrical activities and thus recover a dignified life. This play tells the story of their reunion and their experiences through representative sequences from classical European literature. Aboard an amazing boat, actors have brought with them their costumes, their accessories and they are ready to play the shows they performed in the past. Consequently, they will lead the audience through a dizzying voyage alternating between their own life stories and pieces of European literature, extracted sequentially from: Aristophanes “the Knights”, Carlo Goldoni “The Servant of Two Masters”, Cervantes “Don Quixote”, Molière “Tartuffe”, Shakespeare “a Midsummer nights Dream,” and finally Goethe’s “Faust”. Hence, towards a tragic-comedy background, the actors will be recurving spectators, actors and witnesses.